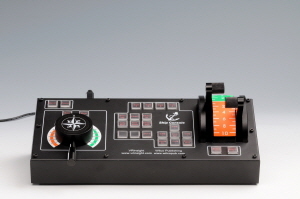 The Tabletop Steering Console interfaces with the BCG Maritime Simulation Tool (MaST) application and can be used in any configuration except when the MaST is "slaved" and the ownship is controlled by a third-party simulator (e.g. a bridge simulator). The unit simply plugs into a USB port on the student's PC for its power and control. The unit operates in two modes: Manual and Autopilot. When in Manual mode (the default operating mode), the ownship's tiller and throttles are directly controlled by the unit. Autopilot mode allows the user to hold course and speed at the time that the Autopilot is engaged. Heading or Speed changes are possible in single degree/knot increments while the autopilot is engaged by pushing the appropriate button. The maneuvering of the simulated ownship is affected by the Class Table parameters defined in the MaST for the ownship, including servo delays.